My son is obsessed with bees. 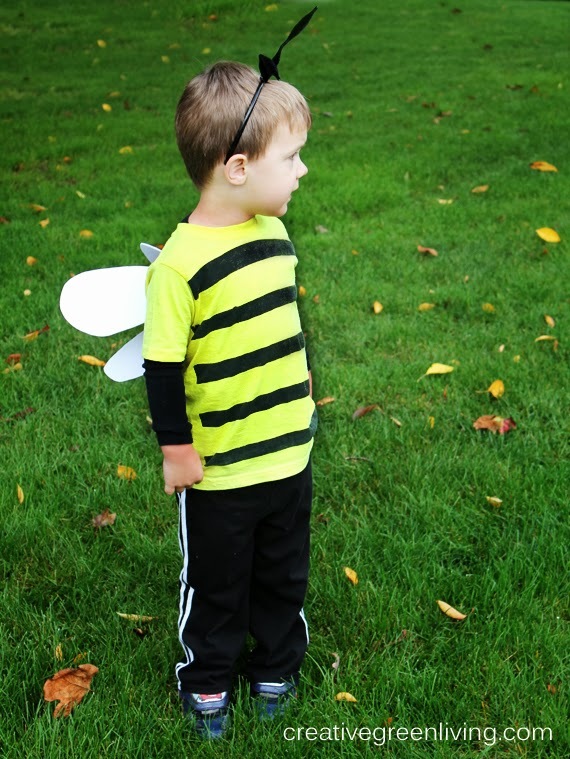 When he turned three, we had a bee birthday party, which was the inspiration for this fun costume. Best of all? It's no-sew, baby! 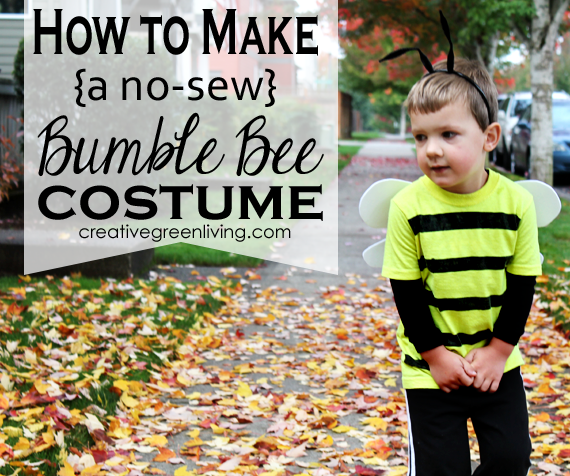 If you are scared of your sewing machine (or just don't have one), you can still have a pretty sweet costume. 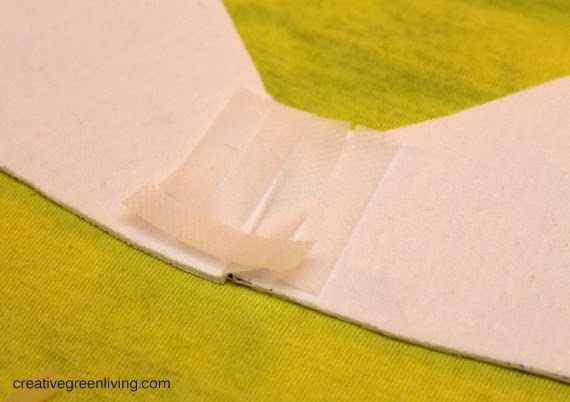 Insert scrap cardboard into the t-shirt to prevent paint bleed through. 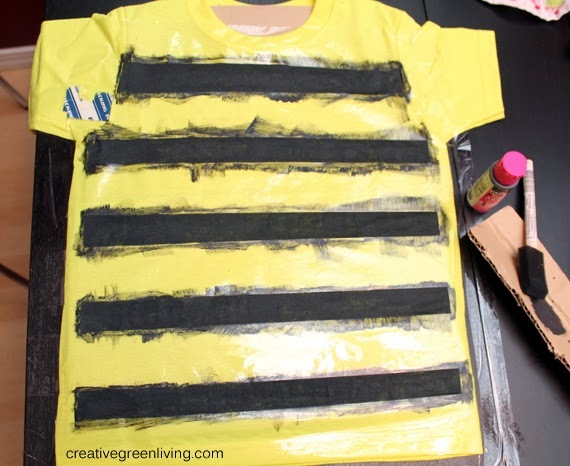 Use the packing tape to mask off areas of the shirt where you do not want stripes. 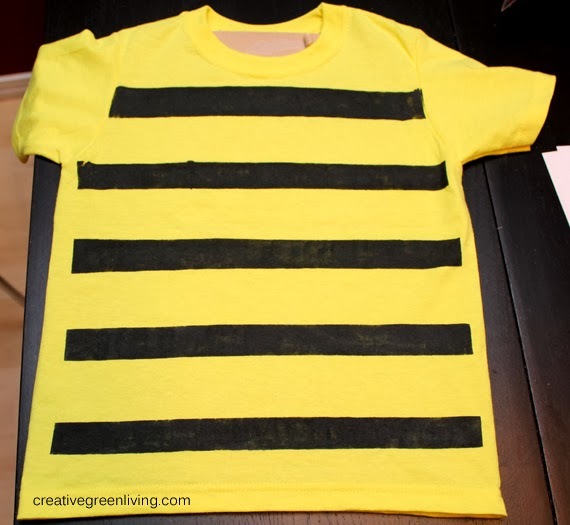 Use the soft fabric paint and a sponge brush to lightly apply the paint in a bouncing motion to the t-shirt until all stripes are painted. Allow the paint to dry (or mostly dry if you are impatient like I am) before peeling away the packing tape. Keep the cardboard inside the shirt until it is completely dry. 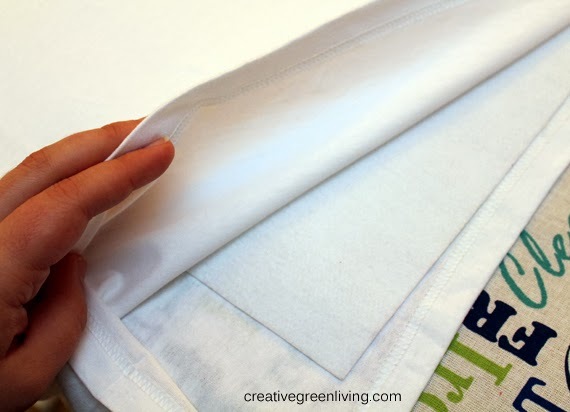 Insert the iron on interfacing into the white t-shirt (or sandwich it between 2 pieces of white fabric). 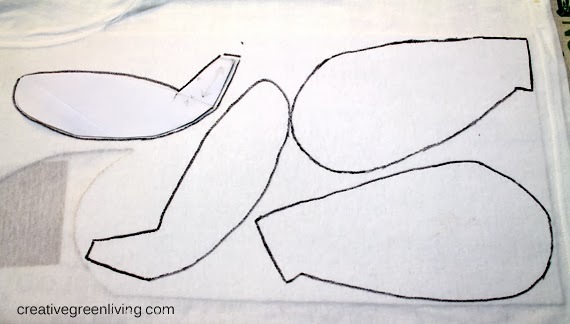 Follow the instructions to fuse it to the fabric with your iron. 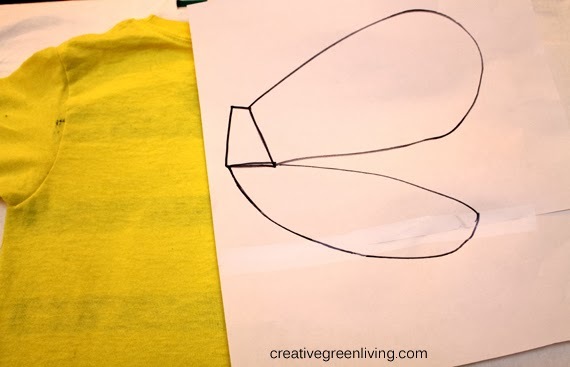 Tape two pieces of printer paper together and lay them on top of the back of your yellow t-shirt (that's dry!) to get an idea of scale for the wings. Use a marker to free-hand the wings you would like. I drew a larger upper wing, a skinnier lower wing and a funny trapezoid to be the place they would join together. 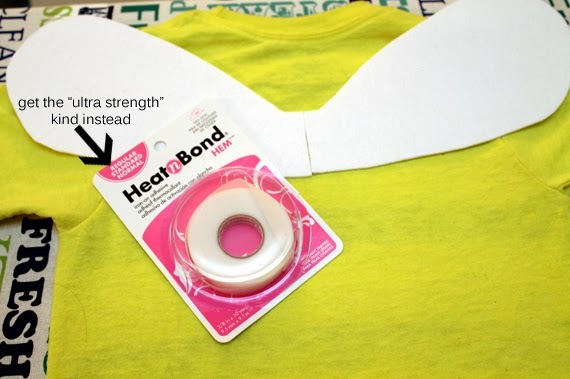 Cut out your wings and adhere them to the back of the shirt using Heat N Bond ultra strength adhesive tape (disregard the "regular" kind pictured - it doesn't hold up!). The most effective way to do this is to create an area in the trapezoid where you overlap the tape to create a larger bondable area. Of course, if you DO sew, you could just stitch them to the body of the shirt as well. In a pinch? Use hot glue. Although, hot glue won't be a long term or washable solution. To make the antenna, cut the thick and thin stem in half (so each half has two bumps). 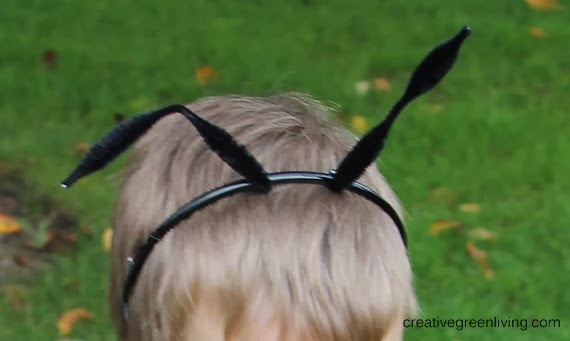 Wrap the bottom half inch or so around the headband and secure with hot glue. Bend the antenna in the middle. 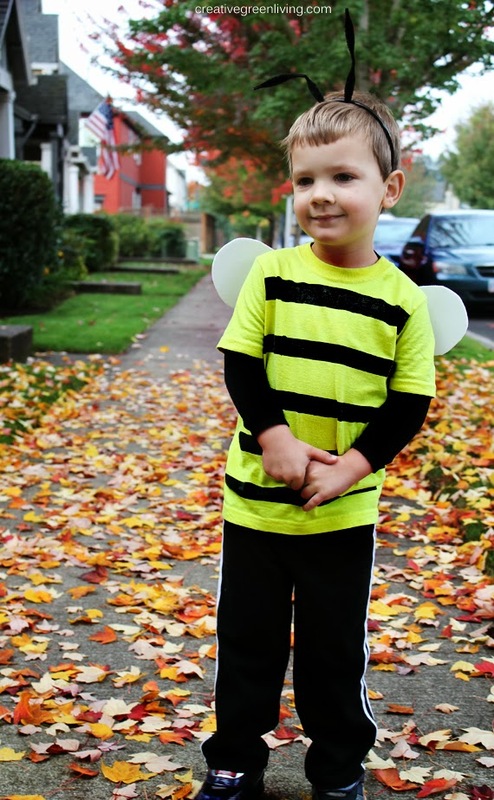 Be sure to wear the long sleeve black shirt under the bee shirt to keep little arms warm. We just had my son wear black track pants he already had to go with the costume. I love how this turned out and that it is sturdy enough to stand up to more imaginative play after Halloween! Do you like this post? Consider subscribing to our weekly newsletter! I don't think sewing black stripes would look bad but it does sound like a lot of extra work. The paint I used it very soft - no itching! One place you could sew instead is the wings. If you used a sewing machine to secure them to the shirt, they would last longer than the iron on tape I used. I'd love to have you feature my post. Please link back to this post and don't publish the directions or more than 2 photos on your site. I love comments! I may not be able to respond to each one but I promise I read them all. Please note that comments on posts more than 10 days old need to be approved. If you don't see your comment right away don't panic! It's just waiting to be approved. I am a participant in the Amazon Services LLC Associates Program, an affiliate advertising program designed to provide a means for sites to earn advertising fees by advertising and linking to amazon.com. My posts may contain affiliate links to products on Amazon. 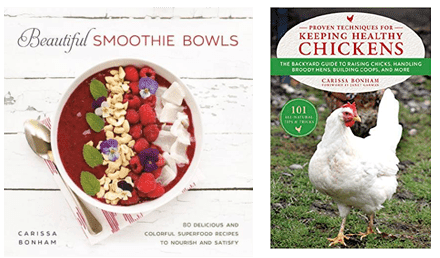 Thank you for supporting Creative Green Living. Carissa's Creativity Space (creativecarissa.com) became Creative Green Living in February 2013. As such the watermarks on older posts may reflect the previous site name. 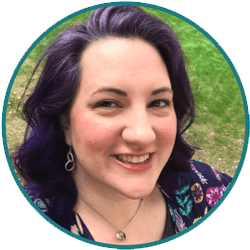 If you love my content, I am so thrilled to have you promote it or share it on social media or in "round up" style blog posts on other websites! When featuring my projects please only feature one image and a link back to my website. If you linked to me with a do-follow link, be sure to email me a link to your finished article so I can promote it in return. Thank you!